Appearance: cylindrical shape of 90 mm dia and up to 50 mm high. Weight of a tablet – 1,25 kg net (+/- 6g). 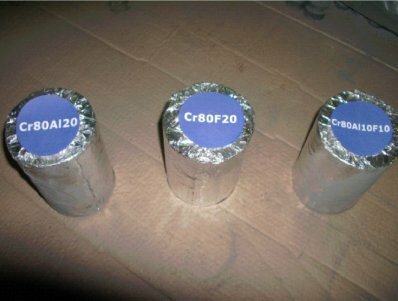 Cr based briquetted tablets are made of pressed mixture of Chrome powder of fine fraction (Cr), Aluminum powder (Al) and/or Flux powder (F). Used as: addition alloy for production of wide range of alloys (primarily Aluminum alloys), where it is required to maintain a set chrome content. convenient shape and packing provides for precise dosing of addition alloy. Packing: briquetted tablets are wrapped with silvery aluminum foil with 3 pieces in each package (column) and packed in carton boxes of 22,5 kg net.